Nama Sungai Mississippi berasal dari bahasa Ojibwe lama iaitu 'misi-ziibi' yang bermaksud 'sungai besar'. Sungai ini adalah sungai kedua terpanjang di benua Amerika Utara. Panjangnya 3733 km dari Tasik Itasca ke Teluk Mexico. Sungai cawangan terpanjang Sungai Mississippi ialah Sungai Missouri, manakala Sungai Arkansas kedua terpanjang. Jika mengikut isipadu air pula, Sungai Ohio ialah cawangan Sungai Mississippi yang terbesar. Mengalir dari Tasik Itasca yang terletak pada aras 450 meter dari aras laut, di Taman Negeri Itasca terletak di Clearwater County, Minnesota. Sebelum air terjun St. Anthony di Minneapolis, tingginya 802 kaki dan menjadi 220 m selepas air terjun itu. 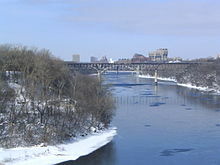 Sungai Mississippi bertemu dengan Sungai Minnesota di Minneapolis, Minnesota, Sungai Wisconsin di Prairie du Chien, Wisconsin, SungaiIllinois dan Sungai Missouri River dekat St. Louis, Missouri, dan Sungai Ohio River di Cairo, Illinois. Sungai Arkansas bertemu dengan Sungai Mississippi di negeri Arkansas. Sungai Atchafalaya bertemu di Louisiana. Sungai Mississippi mengalir antara kawasan Pergunungan Rocky dengan Gunung Appalachian. Rencana ini memerlukan kemaskini dalam Bahasa Melayu piawai Dewan Bahasa dan Pustaka. Sila membantu, bahan-bahan boleh didapati di Sungai Mississippi (Inggeris). Jambatan Stone Arch - bekas jambaran kereta api (kini laluan pejalan kaki) di Minneapolis dan National Historic Engineering Landmark. Jambatan Black Hawk, menghubungi Lansing, Allamakee County, Iowa dengan rural Crawford County, Wisconsin, locally referred to as the Lansing Bridge and documented in the Historic American Engineering Record. Jambatan Julien Dubuque - A bridge connecting Dubuque, Iowa and East Dubuque, Illinois that is listed in the National Register of Historic Places. Jambatan Interstate 74 connecting Moline, Illinois to Bettendorf, Iowa is a twin suspension bridge, also known historically as the Iowa-Illinois Memorial Bridge. Jambatan Rock Island Government connecting Rock Island, Illinois to Davenport, Iowa. Located just southwest of the site of the first bridge across the Mississippi River, it is one of only two bridges in the world with two sets of railroad tracks above the auto lanes. It also co-located with Lock and Dam #15 - the largest roller dam in the world. Jambatan Rock Island Centennial connecting Rock Island, Illinois to Davenport, Iowa. Jambatan Great River connecting Burlington, Iowa to Gulf Port, Illinois. Jambatan Santa Fe - di Fort Madison, Iowa, the largest double-deck swing-span bridge in the world; It is the last operating swing bridge over the Mississippi River for automobile traffic and is listed in the National Register of Historic Places. Quincy Bayview Bridge - cable-stayed bridge connecting Quincy, Illinois and West Quincy, Missouri via westbound US Highway 24. Eastbound traffic into Quincy is served by the older Quincy Memorial Bridge. Clark Bridge also known as the Super Bridge as the result of an appearance on PBS program Nova. This cable-stay bridge constructed in 1994 connects Alton, Illinois to Black Jack, Missouri. It is the northernmost river crossing in the St. Louis metropolitan area and is named after explorer William Clark. Chain of Rocks Bridge - A bridge on the northern edge of St. Louis, Missouri; famous for a 22-degree bend halfway across and the most famous alignment of Historic US 66 across the Mississippi. Eads Bridge - A bridge connecting St. Louis, Missouri and East St. Louis, Illinois; the first major steel bridge in the world, and also a National Historic Landmark. This bridge now carries the St. Louis MetroLink light rail system. Chester Bridge - The bridge that connects Chester, Illinois to Missouri and eventually Perryville, Missouri. The bridge has been struck at least twice by tornadoes. Hernando de Soto Bridge - carries Interstate 40 to connect Memphis, Tennessee and West Memphis, Arkansas; listed in Guinness Book of World Records for its unique structural "letter" shape. Frisco Bridge - was the first crossing of the Lower Mississippi and the longest cantilever truss steel railroad bridge in North America when it opened on May 12, 1892. It connects Memphis, Tennessee and West Memphis, Arkansas and is listed as a Historic Civil Engineering Landmark. Memphis-Arkansas Memorial Bridge - the longest Warren truss- style bridge in the United States which carries Interstate 55 to connect Memphis, Tennessee and West Memphis, Arkansas; also listed on the National Register of Historic Places. Huey P. Long Bridge - Jefferson Parish, Louisiana, the first Mississippi River span built in Louisiana. Crescent City Connection - connects the east- and westbanks of New Orleans, Louisiana; the 5th-longest cantilever bridge in the world. Jambatan Sungai Mississippi I-35W - Jambatan Interstate 35W di Minneapolis, Minnesota, runtuh pada 1 Ogos 2007. ^ Median of the 14,610 daily mean streamflows recorded by the USGS for the period 1967-2006. Laman ini diubah buat kali terakhir pada 10:36, 12 Jun 2017.